In the past we have shown you how to setup FeedBurner for your WordPress site. Recently we had an issue here at WPBeginner where our Feedburner feed was not updating. We published a post 8 hours ago, and our feed was still not updated. After some tinkering around and research, we managed to find several potential solutions. In this article, we will show you how to fix WordPress FeedBurner feeds not updating. If you followed our step by step guide to setting up FeedBurner, then you should already have Pingshot activated. If you haven’t, then you should try activating it. Once you log into FeedBurner, select your feed and click on the publicize tab near the top of the dashboard. In the left column you will now see a button for “Pingshot”. Click on this and select “activate”. This will cause your feed to ping every time there is an update. Some users suggested that this fixed the issue for them. Since we already had this activated, it was not a solution for us. So we jumped into the Troubleshootize tab in FeedBurner where it told us to Ping our feed. In the “troubleshootize” tab, click on the “pinging feedburner” link. This will bring you to a page where you can type in your blog’s URL. Press the “Ping Feedburner” button to update your feed immediately rather than waiting on Feedburner’s automatic update that happens every 30 minutes. We tried doing that, but it did not work. It returned error saying invalid address. Again in forums, folks suggested that this worked for them. But as you can see with our reaction, it did not work for us. As we scrolled down the list of troubleshooting options, there was the option to Resync your feed. On the troubleshootize page if you scroll down to the bottom, you will find a button labeled “Resync Now”. Clicking on it will clear Feedburner’s cache and refill it with your new content. We clicked on that button and “WOOT” it was fixed. Our new content was now appearing on the feed, but why should we have to do this every time? There should be a solution that would fix the issue permanently. After doing a bit more research, we found that this issue was being caused by caching plugin. We did a quick research and found several users having this issue while using W3 Total Cache. Frederick Townes, developer of this plugin, had also suggested a fix for these. As a matter of last resort, if you have a caching plugin like W3 Total Cache or WP-Supercache installed then you may have to clear the cache from your admin panel or simply disable caching the feeds. 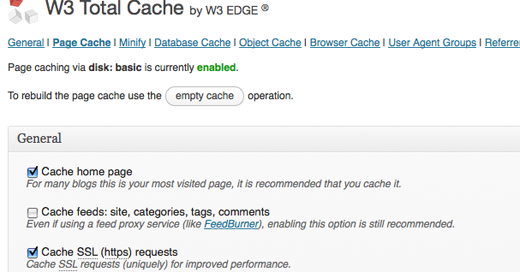 Although this is written for W3 Total Cache, a similar method will work for other plugins. Go to “Performance” in the left hand column. Under that there should be an option for “Page Cache”. Click on it and then uncheck the box that reads “Cache feeds: site, categories, tags, comments”. This will prevent your plugin’s cache from backing up and not allowing Feedburner to display new content. Also note that FeedBurner will not process an original feed over 512kb. If you find yourself into this problem a lot (or notice the solutions in this article aren’t working), reduce the number of posts displayed in your WordPress feeds by going to Settings &raquo Reading page. Now you have the way to fix WordPress FeedBurner feeds not updating. Did these methods worked for you? or did you try something else that worked? Do let us know in the comments.